City Sticker are now on sale. Through April 17, 2017, the cost is $30. After April 17, drivers are subject to citation into city court, and the cost of stickers go up to $72. 2017 City Stickers are now on sale! The Dyer Municipal Code says, “Each resident of the city who owns, leases, or operates a motor vehicle which is required to be registered with the state department of revenue motor vehicle division shall be responsible for registering each such motor vehicle with the City Recorder between january 1st and April 15th each year.” If you have questions about whether you are required to purchase a city sticker, please contact City Hall at (731) 692-3767. 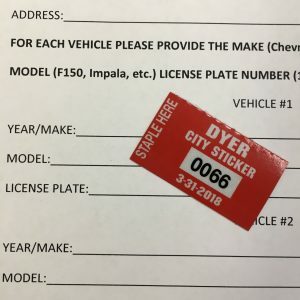 To purchase a city sticker, please have the year, make (manufacturer), model, and license plate number for the vehicle. Having this information already will really speed up the process!